Last week the Bureau of Economic Analysis released state level GDP estimates for 2014, along with major historical revisions going back to the 1990s. As Oregon typically does, it ranked well again in 2014, clocking in at 3.6% inflation-adjusted growth, ranking 6th best among all states. 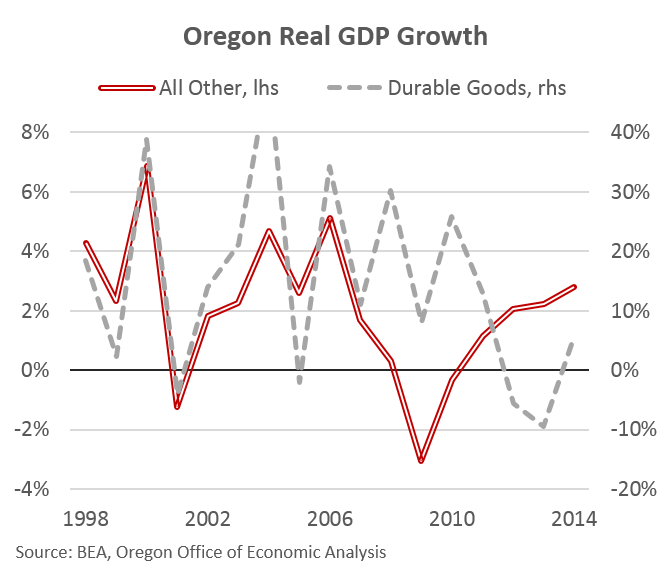 As we try to point out from time to time, Oregon’s state GDP tends to overstate our economic strength, when compared with other measures like jobs, income and the like. Of course, Oregon tends to rank well on those other measures during expansions. Less so during recessions. What is interesting are the revisions and unfortunately we do not have a ton of detail yet on them. The BEA factored in 2 new data points/series into these estimates, including the survey of manufacturers and the 2012 economic census. BEA will release more details on these series and the revisions next month (July.) 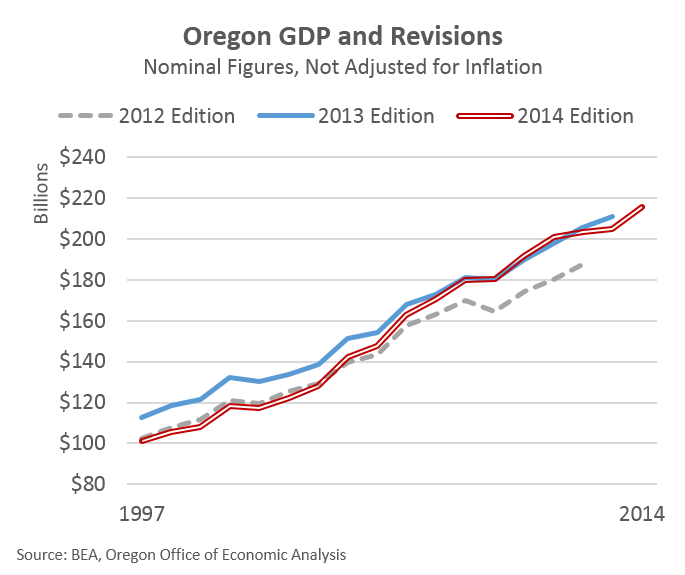 However, as of now, the revisions do not change the bigger picture story of Oregon’s strong GDP over time. It does alter the pattern and some of the specifics across the years. The first graph below shows nominal GDP (not adjusted for inflation) for each of the past 3 years releases. The big change from 2012 to 2013 was the incorporation of intellectual property products (R&D spending being a big part here), that BEA added to both the U.S. GDP and local level figures. One can see this in the big shift upward from the gray line to the blue line. The latest figures (red line) factor in those new data results. In terms of Oregon’s relative rankings across the states, the specific year-to-year numbers have changed, particularly 2012 and 2013. 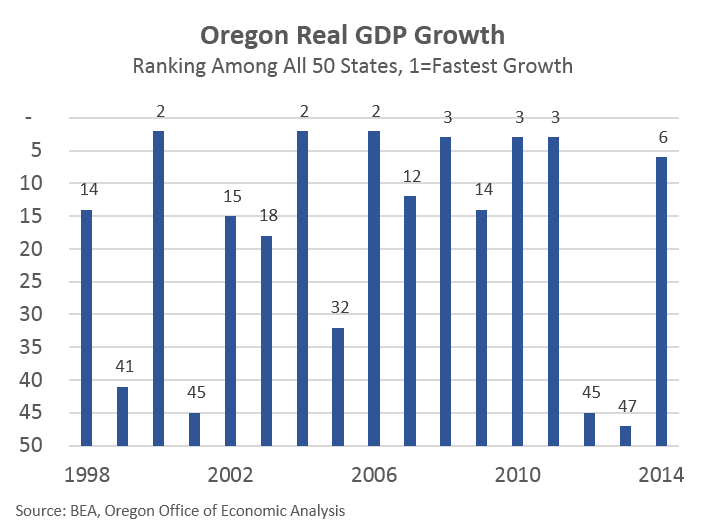 But, over this extended period from 1998 to 2014, Oregon’s GDP has averaged 1.5 percentage points faster growth than the nation each year. Even with the downward revisions to recent years, Oregon still outperforms most states over the Great Recession. Oregon ranks 3rd best in state GDP growth from 2007 to 2014, trailing North Dakota and Texas. Much of our GDP advantage comes from our high-technology manufacturers, which provide an extraordinary amount of value-added to their products. They also undergo major R&D investments on a fairly regular basis as well. At times, it can be helpful to separate out this high flying industry and examine everything else, as shown below. Given data availability I had to separate out all durable goods manufacturing (includes our metal makers, aerospace, etc) but the trends are clear. While state GDP performed well over the the past decade, what most firms and workers felt and saw looks a lot more like the red. In fact, other measures like employment and income look similar to the red line. It indicates that growth has accelerated in recent years. All told, now that the economy is on the upswing, Oregon is once again among the fastest growing states across a host of economic measures. The economy is not fully healed yet, but provided recent rates of growth continue for another couple of years — which our forecast calls for — then Oregon should reach full employment at that time, some 9 (long) years after the onset of the Great Recession.